To recall, Reliance Jio had last week disclosed just the new Rs. 303 monthly tariff plan when it announced the subscription. The new Jio Prime plans are now listed on the company's website and are divided for Postpaid and Prepaid customers, alongside the regular non-Prime plans. Non-prime plans have the same tariffs, however, do not come with the same benefits. So for example, if you're a Prime subscriber then a Rs. 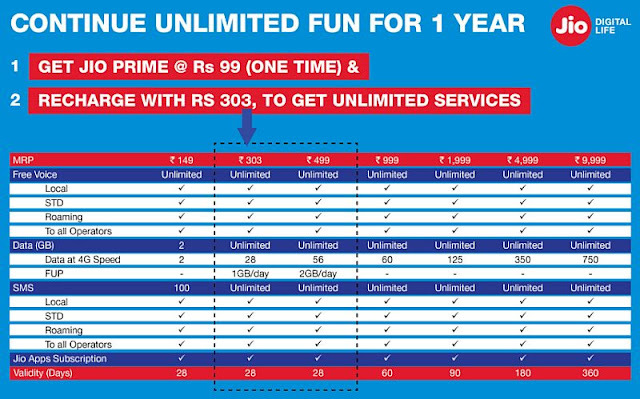 19 one-day plan gets you 200MB data, but, non-Prime subscribers get just 100MB of data. Those interested in Jio Prime prepaid plans can buy from the following packs: Rs.19 - which comes with one day validity, and also offers 200MB 4G data; Rs. 49 - comes with three days validity, and offers 600MB 4G data; Rs. 96 - which comes with seven days validity, and offers 7GB 4G data with a cap of 1GB daily data, and Rs. 149 - comes with 28 days validity, and comes with 2GB 4G data, and 100 SMS cap. Notably, all Jio Prime plans offer unlimited voice calls to all operators as well as on roaming. Reliance Jio's Rs. 303 plan, which was announced last week, comes with 28 days validity and offers 28GB 4G data with 1GB daily data cap. Some of the other packs available for Jio subscribers wishing to switch to prepaid include Rs. 499 pack - comes with 28 days validity, and offers 56GB 4G data with a daily limit of 2GB. Reliance Jio will be also offering some long-term plans to its prepaid subscribers - Rs. 999 pack will come with 60 days validity, and offers 60GB 4G data with no daily limit. Other packs listed are Rs. 1,999 (90 days), Rs. 4,999 (180 days), and Rs. 9,999 (360 days) with 4G data limit of 125GB, 350GB, and 750GB 4G data respectively.